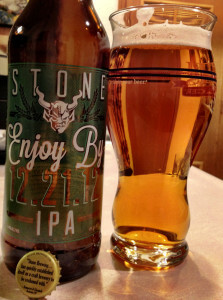 In Minnesota we have waited patiently, as most Midwesterners do, for Enjoy By IPA from Stone Brewing Co. We don’t want to complain or cause too much of a ruckus here in the Midwest but that might be part of the problem. I’d also suggest including @StoneBrewingCo at the end of your tweet. Make sure the tweet doesn’t start with @StoneBrewingCo as we want to ensure all of your followers see the tweet even if they are foolish enough not to follow Stone. Next, go to http://www.stonebrewing.com/enjoyby/ and click on Vote at the top of the page which will take you to the Vote Now button. Click on the Vote Now Button and the vote with your E-mail address and go ahead and enter your Gmail address along with a MN Zip Code. Then vote again with that Hotmail account you haven’t used since college. Stop reading this and get out and Tweet that is unless you really want to drive to Iowa to get your fair share of EnjoyBy!